The opening hole is dead straight but has bunkers protecting both sides of the fairway and is tougher than it looks especially around the green which is also well-protected by bunkers both sides. 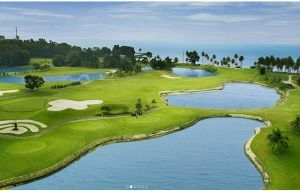 A tough second hole which is very long par 4 with no less than four ponds along the right to catch the slice and the sea along the left – to make things even more difficult the green is totally surrounded by bunkers. 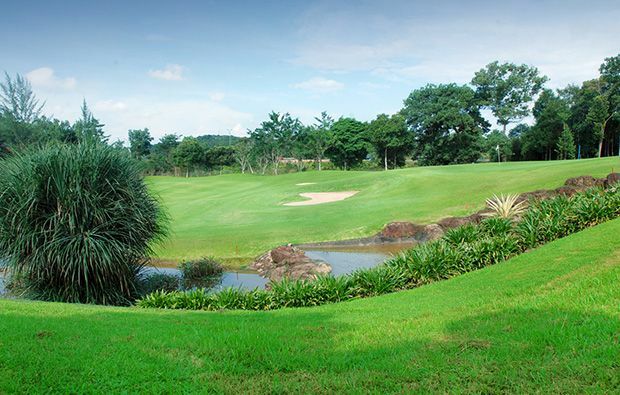 The 3rd is a shorter uphill par 4 with OB along the left and bunkers either side of the landing area – avoid them and your reward is an easy approach to the green. With water all the way along the right from tee to green and two bunkers protecting to the front the par-3, 4th has become quite a daunting prospect as you have the OB line close to all sides of the green. The 5th which is a dogleg par 4 is rated the most difficult on the course requiring a long carry off the tee to get in position for your second into the green – get offline and you could end up OB as its lines both sides. Bunkers protect the green on both sides and behind. 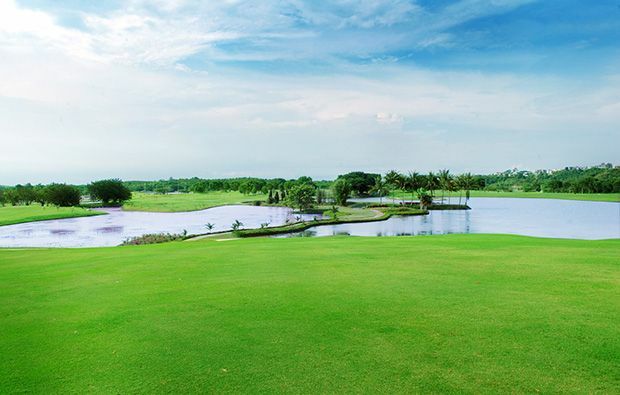 The par-5, 6th is another dogleg with a lake on the left and a pond to the right – the sloping fairway tends to push your second towards the hazard so aim right and watch out for the greenside bunker. The 7th is the longest par-3 on the course with no less than eleven bunkers and if that wasn’t enough you also need to watch out for the ponds along the left of the fairway and green. 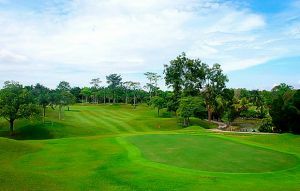 You play off the tee on the 8th towards the Hindu temple taking care to avoid the trees on the right which are out of bounds. Slightly blind shot to the undulating green. A difficult downhill par-5 to finish with Ob both sides of the fairway and a stream running across in front of the green which also has a bunker left and more water to the right. 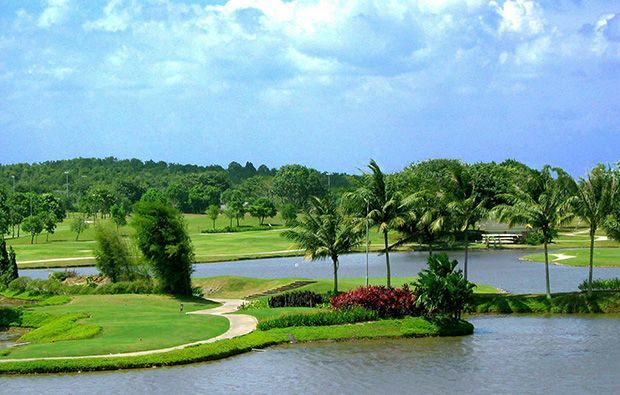 The opening hole on the back nine is a medium length par-4 with an uneven fairway with a pond and a deep bunker along the right – the multi-tiered green is protected by bunkers on both sides. The short par-5, 11th offers the best chance for a birdie on the back nine as it is flat and quite wide although care must be taken with your approach as the sea gets very close to the green along the left. The 12th has tall trees all along the right blocking out your view to the sea – look out for the waste bunker to the right of the fairway and the bunkers surrounding the green. The 13th is a long par-3 which is often affected by the prevailing winds so you may need an extra club. 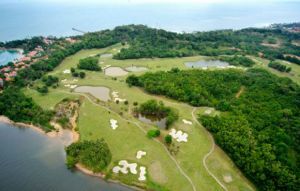 The 14th is a driveable par-4 with mangrove along the right and a green surrounded by bunkers on all sides. The par-4, 15th is the most difficult hole on the inward nine –along the left you have three ponds and you need to avoid the trees along the right. A stream runs across in front of the wide but not deep green so beware the OB line over the back. If you can avoid the water either side of the fairway on the 16th then you should score Ok but be careful of the stream running in front of the green and the bunkers either side. The 17th is a par-3 with an almost island green with the added protection of bunkers all around it and a putting surface which is very difficult to hold. 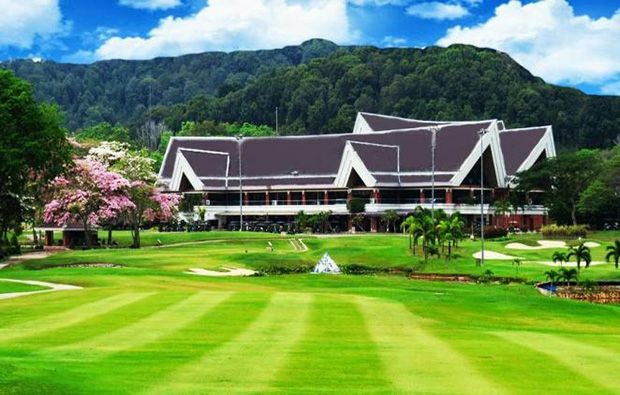 The 18th is a short par-5 with a stream bisecting the fairway and four bunkers around the green – a definite birdie chance for longer hitters. 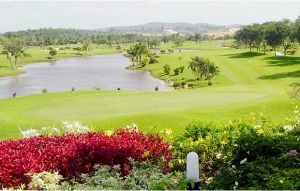 Southlinks Country Club has different Services to offer. Choose a date and number or players to see the rates.